What have they done with Richard Burr? If you ask me, I think they’ve kidnapped U.S. Sen. Richard Burr and put some imposter in his place. What else explains the goofy positions, if that’s the right word, that the junior U.S. senator from North Carolina has taken on environmental issues in northeastern and northwestern North Carolina? What makes it puzzling is that Burr isn’t usually reluctant to tackle hard issues. Remember the tobacco buyout program he helped engineer through Congress a few years ago? So it’s not that he’s a stranger to controversy. But on two hot issues, he hasn’t spoken out. One is the Navy’s proposed Outlying Landing Field. A lot of politicians avoided opposing that site close to a national wildlife refuge, but lately the state’s leaders are opposing it – Republicans and Democrats alike. Recently state Commissioner of Agriculture Steve Troxler, a Republican, joined Gov. Mike Easley, a Democrat and late joiner of this campaign, in opposing the site in Washington and Beaufort counties and supporting another choice in North Carolina. Now Republican gubernatorial candidate Bill Graham of Salisbury has come out against the Navy’s preferred site, and Republican U.S. Sen. Elizabeth Dole has urged the Navy to listen to residents of the area. She hasn’t formally opposed it, but word is that her patience with the Navy is wearing thin because the service refuses to actively consider another site. Last week he took another walk, this time on the six-decade-plus controversy over the “road to nowhere” that the federal government promised to build in 1943 on the north shore of Fontana Lake. The road would cost more than half a billion dollars and destroy vital habitat. The Swain County commissioners support a $52 million settlement, and so does newly-elected Rep. Heath Shuler. Shuler defeated Rep. Charles Taylor, who supported building the road even at its out-of-sight cost. Now 17 members of Congress have signed a letter to Secretary of the Interior Dirk Kempthorne asking him to support giving unspent money from an environmental impact statement on the road – about $6 million – to Swain County as a partial payment on the proposed $52 million settlement. The letter was signed by nine members of Congress from Tennessee and eight from North Carolina, including Sen. Dole. Well, continuing to support the 1943 plan is a stance, but it’s a pricey one. What’s strange is that he worries there is no assurance of federal funding for a $52 million commitment. But there’s no assurance of federal funding commitment for the nearly $600 million or more the road would cost, either. Is there any doubt which is more likely to happen? Which is why a lot of folks are wondering: what in the world have they done with Richard Burr? I never met Jason Ray, the UNC mascot who died from injuries in an accident just before the regional semifinals last week in New Jersey. But I spent many winter evenings with him over the past three years, watching him help whip up Tar Heel fans as UNC basketball teams whipped up on scores of other teams. I know the job was shared by several students and of course I don’t know which nights Jason was in costume, but I do know the mascot was always fun to watch. I also know a little about what it takes to do that sort of thing. A couple of hundred years ago, or so it seems, I was a Carolina cheerleader at a time when Dean Smith was just emerging as a coaching genius and beginning to win national attention. 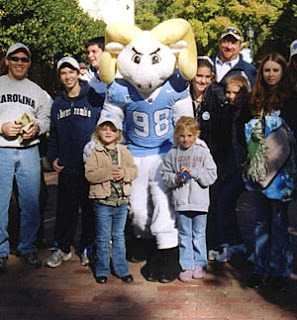 In those days one of my jobs for pep rallies was to fetch the Tar Heel mascot – one of a series of wooly rams known as Rameses – from the farm of Bob Hogan and bring him to campus. Hogan, whose family had been farming in Orange County for generations, would help me take out the back seat of my 1956 Chevrolet Bel Air, and lead Rameses in one door. When I got to the campus destination, someone would help me lead Rameses out the other door. Hogan himself would handle those duties on football Saturdays. I don’t recall whether we had a Tar Heel mascot in costume in those days, but the real Rameses attended mostly football games and, I guess, other outdoor sports. One of my cheerleading colleagues was Dave Bennett, a year or so younger than I, who would go on to become head cheerleader. After graduation, Dave became a teacher, a coach and head of the state government intern program for a time before going into the family plumbing supply business in Burlington, Bennett-Hockett Supply Co.
-- Senate Bill 84, to amend the N.C. Constitution to make legislative terms four years long rather than two years, sponsored by Sen. David Weinstein, D-Robeson. -- SB Bill 168, to move the presidential primary in 2008 from early May to the first Tuesday in February, which would be Feb. 5, 2008, sponsored by Sen. Andrew Brock, R-Davie. -- SB 954, to put North Carolina in a compact with other states agreeing to elect the president by popular vote, sponsored by Sen. Dan Clodfelter, D-Mecklenburg. -- SB 957, to amend the N.C. Constitution to provide for the nomination of appellate judges by a nominating commission, appointment by the governor and periodic nonpartisan retention elections – replacing the state’s current system of electing judges, sponsored by Clodfelter. -- SB 1124, to amend the Constitution to provide that the superintendent of public instruction be appointed by the State Board of Education, rather than chosen by election, sponsored by Clodfelter. -- SB 1128, to provide public funds to finance the campaigns for eight Council of State offices, including superintendent of public instruction, auditor, treasurer, secretary of state, attorney general, commissioner of agriculture, commissioner of labor and commissioner of insurance, sponsored by Clodfelter. Candidates would have to agree to fundraising and spending limits to participate. -- SB 1205, a similar bill to provide public funding of eight Council of State races, but not governor or lieutenant governor, starting in the 2012 election, if candidates agree to limit fundr-raising and spending, sponsored by Sen. Martin Nesbitt, D-Buncombe, and Sen. Fletcher Hartsell, R-Cabarrus. -- SB 1261, to establish a pilot program experimenting with publicly financed elections in four legislative districts – two House and two Senate – recommended by the minority and majority leaders of the House and Senate and chosen by the State Board of Elections. Sponsored by Sen. Bob Atwater, D-Durham. -- SB 1469 and 1470, to cut in half the number of statewide elected officials, by providing that the elected members of the Council of State will be the governor, lieutenant governor, auditor, treasurer and attorney general and that they would continue to be elected by the people. The remaining offices would be appointed by the governor. Sponsored by Sen. Charlie Albertson, D-Duplin. A couple items in the news this week drove home the point how much North Carolina has changed. One was sheer numbers: North Carolina added 800,000 residents since 2000 – some 300,000 in the Charlotte region. Mecklenburg and Wake are among the fastest-growing areas in the country, and it won’t be long before the state passes Ohio in population. Hard to believe. Here’s another change that’s hard to absorb: the growing support in the N.C. General Assembly for a bill to ban smoking in public places including work places and restaurants. It reflects a decline of the tobacco lobby’s power in the 21st century. It hasn’t passed yet, but it zipped through a House committee the other day on a more than 2-1 vote but won't be on the House floor for days while its sponsor tries to round up more support. Its primary sponsor is House majority leader Hugh Holliman, a Davidson County Democrat and former smoker who lost a sister to lung cancer. He has the support of 10 cosponsors and support from some Republicans as well as Democrats. State Health Director Leah Devlin backs the bill, and so does Rep. Alice Graham Underhill, D-Craven, whose father, the late N.C. Agriculture Commissioner Jim Graham, was an ardent defender of all things tobacco. But things change. Just 14 years ago, the tobacco lobby was still flexing its muscle in Raleigh. It persuaded the 1993 General Assembly to co-opt local control of smoking ordinances by restricting the ability of local governments to declare no-smoking areas after Oct. 15 of that year. It was an outrageous preemption of home rule and meant that many thousands of North Carolinians had to endure second-hand smoke in public places. They still do, and that’s bad public policy. Dr. Devlin told reporters Thursday that second-hand smoke increases the chance of heart disease and lung cancer in those who must breathe it. There’s no safe level of second-hand smoke, she said. “It’s a very serious health hazard,” she added. Things began to change sharply several years ago. When Gov. Mike Easley – born and reared in tobacco country and in a tobacco family – proposed hefty raises in cigarette taxes, it was one sign that the axis of the Earth had tilted. And when the General Assembly approved a two-step increase, the ground in bright-leaf country wobbled some more. It will be interesting to watch how Holliman’s bill fares in the House, but it is clear that Big Tobacco no longer has the clout it once did in Raleigh. The book on Easley: Whew! The state has just published a new edition of “The Governors of North Carolina,” a 211-page paperback book that features biographic sketches of the 99 North Carolinians who have served as governors since Ralph Lane in 1585-86. It’s edited by Michael Hill, a state historian, and sells for $29.35 (including tax and shipping). You can arrange for a copy by contacting francis.kunstling@ncmail.net or calling the N.C. Division of Archives and History at (919) 733-7442. Alas, the entry on the state’s current governor, did not read with the same kind of raw-material, bark-still-on candor. Gov. Michael Francis Easley’s entry read more like a public relations pamphlet. (Indeed, the book's introduction notes, Easley's entry was written after consultation with his press office.) Among other things, it referred to “[T]he more than $400 million in annual funds generated by the new lottery” for schools – except the lottery hasn’t generated that kind of money yet. Whew! Even Easley’s admirers will find that spread on a little thick. Perhaps state officials should wait until governors have left office before they try to assess their gubernatorial terms. I appreciate the awareness you and your colleagues are trying to raise regarding the conflicts of interest and fraud that is pervasive in some political camps. With that said, your reference to the work of David Ingram and Rick Rothacker should have cited the earlier work by Forbes magazine (Neil Weinberg and Jason Storbakken) which first exposed Richard Moore’s “Pay to Play" and related conflicts of interest. By all means, please do not let up on the message but in fairness to those who did the original research and put Moore in the national spotlight, they should be referenced as well. The point I was trying to make was not who got the story first, but how well our state’s open records laws have served the public interest in helping folks understand what was happening. long way to go in changing its attitudes towards government corruption. I wish they would simply ban lobbying altogether. It is a cancer in the state and in this country! When I studied political science, the model was that a state governor’s cabinet would be appointed and confirmed, just as the U.S. cabinet is. Otherwise, you may have a group of officials working against each other. In the same vein, I loathe electing judges. As a board member of Democracy North Carolina and resident of Mecklenburg County, I am very proud of the work that Bob Hall did in exposing the corruption in the legislature. There is no doubt that this was not the first time something like this has happened but one way we can help reduce the chance for it to happen again would be if the state legislature were to expand our public financing of elections. If we were to expand this program so that it covered our legislative and council of state races we could avoid these sorts of embarrassments. Jim Black represented me in the legislature for several years and I think he did a good job but, in my opinion, the pressure to raise more and more cash clouded the judgment of a well meaning public servant. Public financing of elections will reduce the need to raise all this cash. I read the Observer every day, and I have the distinct impression that the Observer came to the conclusion that Jim Black was a crook very late in the day. Even though you reported that Black created a do-nothing job for Michael Decker etc., you seemed to be saying, "at least he is our crook, he has done so much for the local area." The alternative media were after Jim Black long before the Observer. In fact, I think Jim Black did what was good for Jim Black, and many local needs went unmet, like prosecutors. Isn’t it sad that a man would sell himself for $28,000? There must be more to the story. And what did Black owe that lady he made the House Historian, anyway? There must be more to that story. House Speaker Joe Hackney says the N.C. House of Representatives is a different place now that new ethics rules are in effect and lawmakers have been taking formal – and informal – training on what’s allowed and what’s not. A test case in point: for years the N.C. Peanut Association has provided free packs of peanuts for lawmakers and guests who visit the speaker’s office. When Rep. Dewey Hill called Hackney a few weeks ago to make sure it was still okay, Hackney told the N.C. Editorial Writers Conference Sunday in Chapel Hill, he started thinking out loud: They employ a lobbyist, don’t they? And wouldn’t the peanuts would be just the sort of gift the new ethics laws or the no-gift register are designed to prohibit? Well, maybe not. The N.C. Peanut Association, it turns out, does not employ a lobbyist. And, Hackney says, “The peanuts have arrived.” But they haven’t been consumed. “I’m the speaker and they are in the speaker’s office.” But Hackney is still figuring out what to do. Should he send a check to pay for them? Hackney says he doesn’t yet know how it’s going to turn out. “It’s a part of our healing process that we are going through,” Hackney says. There has been some concern, he noted, that members might find it difficult to parse through all the new rules. No one wants to get caught up in some problem, but in the main, he said, the new rules have been well-received. The same kind of thing has gone on in the Senate. At a Mecklenburg delegation meeting last week, a group of citizens asking for county authority to impose a ban on smoking in restaurants brought coffee mugs for every legislator. At the close of the meeting, however, delegation chairman Sen. Dan Clodfelter reminded members that the mugs might represent the sort of gift the new rules prohibit. I didn’t count every one, but it appeared to me that the mugs were left behind on the table as lawmakers adjourned. Ever since the Navy published its supplemental environmental impact statement on a controversial landing field in Northeastern North Carolina a couple weeks ago, folks have been having fun with the Pentagon’s contemplated techniques for changing the habits of birds that pose a problem to costly jets. The list includes changing crops from winter wheat, which attracts large birds, to grass, which doesn’t; using fireworks or other audible mens to shoo the birds; chemicals or poisons to deter or eradicate birds, and, if necessary, gunfire. Let’s just hope the birds don’t have a supplier for their own armament. Here’s a story by the N&O’s Wade Rawlings that sheds more light on the Navy’s possible deterrents to avoid bird-aircraft collisions. And here’s a cartoon by the N&O’s Dwane Powell, about putting the Battleship North Carolina back into service to help guard the OLF. And here’s a funny editorial from The Wilmington Star suggesting strafing and napalm. Here’s the strange part: Why have a federally-sponsored, taxpayer-financed national wildlife refuge, meant to attract huge birds from near the Arctic Circle to come all the way to North Carolina, if it’s also going to be federal policy to discourage those birds from doing what they normally do once they get here – flying out of the refuge each day to feed in nearby fields? Why invite those birds down for the winter -- and then starve ‘em, scare ‘em, deafen ‘em, sicken ‘em or shoot ‘em? Only the federal government could come up with such a costly contradiction. Why isn’t Easley pushing for more squadrons of F/A-18EFs at Cherry Point? It seems like he should go talk to the folks in Havelock and New Bern and get their opinion about the OLF before representing only part of the state. What about a parallel runway at Cherry Point? Havelock and New Bern would welcome it. What about (federal Judge) Terry Boyle’s home being in the flight path for the OLF? Does that cloud his judgement? You should look into these questions before ever writing about the OLF again if you want to write a story that amounts to more than political finger pointing. Thanks for your note. Open Grounds farm is, best of all, a former wetlands that the Navy could do a lot of environmental good by putting the airfield there and restoring the wetlands. It’s in a good location strategically; there is a bombing range some miles away, but not much closer than the bombing ranges near the Washington County site. The Navy ruled out Open Grounds not for any other reason than that it doesn’t want to have to coordinate traffic or landings with the Marine Corps, which as you accurately suggest, has sufficient room for parallel landing strips already. But there is considerable inter-service rivalry that could make taxpayers pay lots more money than they need to build the field. As for putting more Super Hornets at Cherry Point: Of course that would be a good idea. But a lot of us remember when the Pentagon planned to put more aircraft at Cherry Point after an earlier BRAC base-closing exercise, and politics steered those aircraft away from North Carolina. A lot of folks worry that’s exactly what will happen again even IF the OLF does come to North Carolina. But you are right about this, too: The area around Havelock and New Bern would welcome the pilots, planes and crew. They’re on record as saying so. About Judge Boyle’s home: He is indeed a resident of Elizabeth City but it is probably a stretch to say he’s in the flight path. At the altitudes those aircraft fly en route from Oceana to any field in North Carolina, folks probably aren’t going to hear the aircraft any more than they hear the commercial aircraft flying over eastern North Carolina. But I’ll ask the judge next time I see him if he worries about overhead traffic. As you may know, I’ve been researching and writing about the OLF for about five years and have written scores of articles on the OLF. I do keep learning about the OLF, but the questions you raise are not new ones. As for political finger pointing, you probably also know this: that’s my job. Thank you for your note and thank you for reading the Observer. Great job! I’m really glad you were able to get some good quotes from the Governor. Thanks for your coverage of OLF. The “Easley eyes political solution to Navy plan” pulled me right in. The intro indicated that he wanted an alternative to the Navy putting a field in the wrong place. One had to read a little further to realize that ANY place would be the wrong place for Mr. Betts. Migratory waterfowl and bird collisions are up there with family farms and apple pie that will be victims. I seem to remember California Condor deaths from the greenie cure for the common cold . . . . . windmills. Poor Jack is mad at the elected officials that betrayed the public. Then he reminds us that three decades ago, elected officials almost allowed an unnamed out-of-state utility to build (gasp) a hydroelectric project. Going back to simpler living made sense to Oliver Douglas on “Green Acres,” as he drove his Lincoln Continental. That’s what Jack wants for himself, and since he is smarter than us, he wants to compel us to taking progress backwards. Hydroelectric generating stations provide pollution free power, flood control, recreation, and generally huge amounts of property tax, as homes get developed on the shore. Why wouldn’t an elected official want that? The last time I checked, the Navy is putting this where it would impact the fewest people; same birds. Moreover, nothing would be more beneficial to the locals. The only growth those residents are seeing is negative. The kids that grow up there move away, because there is nothing for them. The Navy facility would not cure all of that, but it would bring in huge amounts to the local businesses. The biggest shame is that you give an opinion like his front page coverage. I miss the optimism of Ronald Reagan, and the way he saw growth that benefited the masses. You’re wrong. The OLF would be welcome in North Carolina, and I’ve said so in the past and will continue. But it makes more sense at Cherry Point on a parallel runway where there’s already room and a welcoming committee ready to embrace more operations, or at Open Ground farms, where the Navy could put the field AND do significant environmental improvements by restoring vital wetlands that were destroyed in the 1970s, or at the site near Vanceboro where there’s plenty of room. Re the hydroelectric plant: You probably know this, but just in case: It was a pumped storage peak-demand project that would require more daytime energy to pump water back upstream to fill the lake than it would produce for peak-demand periods late in the day or early mornings -- and North Carolina wouldn’t have gotten anything from it. The project was proposed by American Electric Power Co. of Ohio -- and that’s why then-presidential candidate Ronald Reagan opposed the project. So did President Gerald Ford. So did Jesse Helms. And finally about growth in the northeast: I’ve spent some time up there with farm families, and you’re dead wrong about that, too. Those kids want to stay on the farm. It’s a God-fearing, patriotic group up there with sons and daughters in the military who hope to come home and run the family farm. Ronald Reagan opposed the hydroelectric project in northwestern North Carolina, and my guess is after he talked with folks in northeastern North Carolina, he’d have reservations about that, too.